For the villages in Iran, see Gigan, Iran. Gigan (Japanese: ガイガン, Hepburn: Gaigan) is a kaiju from Toho's Godzilla and Zone Fighter franchises who first appeared in Godzilla vs. Gigan. Gigan is a cyborg space monster sporting a buzzsaw weapon in its frontal abdominal region and large metallic hooks for hands. Gigan is considered one of Godzilla's most brutal and violent opponents, being the first kaiju in the Toho sci-fi series to cause Godzilla to visibly bleed. WatchMojo.com listed Gigan as #4 on their "Top 10 Godzilla Villains" list, while Complex listed the character as #2 on its "The 15 Most Badass Kaiju Monsters of All Time" list. Gigan debuts in the 1972 film Godzilla vs. Gigan, in which Gigan and King Ghidorah are summoned to Earth by the antagonist Nebula M Space Hunter aliens, who wish to subjugate the Earth in order to create a utopia of "perfect peace". They are challenged and ultimately defeated by Godzilla and Anguirus. In the 1973 film, Godzilla vs. Megalon, Gigan is again sent by the Nebulans to assist the people of Seatopia in their assault on humanity by aiding their god, Megalon, in a battle against Godzilla and Jet Jaguar. After receiving a broken arm at the hands of Jet Jaguar, Gigan retreats to space, leaving Megalon to face Godzilla and Jet Jaguar alone. Gigan then makes an appearance on Toho's television series Zone Fighter the same year. 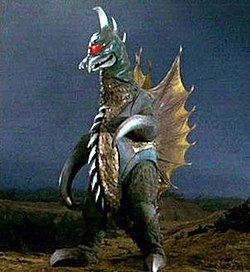 After his battle with Godzilla and Jet Jaguar, Gigan is captured in space by the Garoga army and sent back to Earth to prevent Godzilla from rescuing Zone Fighter, but he is soundly defeated by him. Left for dead, Godzilla leaves believing he is victorious, but Gigan revives shortly afterwards and battles Zone Fighter himself. In the final battle, Gigan is finally killed by Zone Fighter. After a 31-year absence he returned in Godzilla: Final Wars. In the film, Gigan once fought Mothra for the fate of the Earth and ultimately was defeated. Later, his mummified body is discovered and revealed to be a weapon used by the Xiliens. Gigan awakes and then creates havoc and destruction in Japan, but is sent to destroy the Gotengo in hopes of not awakening Godzilla, but fails. Gigan does manage to bring down the Gotengo, however, and then faces off against Godzilla and fails. During the battle between Godzilla and Monster X at the end of the film, Mothra tries to assist Godzilla, but is intercepted by a revived Gigan (whose arms have been retrofitted with two pairs of enormous double chainsaws in place of his iconic blades). The two engage in combat and, after briefly interrupting Godzilla and Monster X's battle, Gigan seemingly kills Mothra by firing his optic laser into her scales. Gigan turns around to aid Monster X against Godzilla, but he is decapitated by his own razor disks (fired at Mothra beforehand and reflected by the scales), and finally defeated by Mothra. This happened by Mothra being set on fire and charging into Gigan exploding them both. Created during the early seventies, when Godzilla films had undergone a comic book-like shift in tone and special effects, budgets were greatly reduced, so Gigan was designed as both a marketing ploy for children's toys and as a completely alien creature whose design would not have necessitated the same attention to detail needed for Godzilla's previously more animalistic opponents. The character was first conceived by Kaoru Mabuchi in his script Godzilla vs. the Space Monsters - Earth Defense Directive, which contained elements that would later be incorporated into Godzilla vs. Gigan, including having a mind-controlled Gigan being teamed up with King Ghidorah, though the script also included Megalon, and the mastermind behind the space monsters' actions was a living brain called Miko. The first Gigan suit was designed by suitmaker Noboyuki Yasamaru, and was worn by Kenpachiro Satsuma. The two initially did not get on well during filming, as Yasamaru focused more on the suit's appearance than on its practicality, at one point making the character's hand-hooks out of pure fibreglass, making lifting them almost impossible. In portraying Gigan, Satsuma deliberately emphasized the character's destructive personality. For Gigan's appearance in Zone Fighter, Satsuma did not reprise the role. Special effects director Teruyoshi Nakano had initially wanted to give Gigan the ability to fire a beam from its forehead in homage to Buddhist art depicting the Buddha sporting a halo around his head, but the idea was scrapped, as Nakano felt that the character was already powerful enough. The beam was nevertheless included in some promotional stills. In January 2019, director of the 2014 Godzilla. Michael Dougherty expressed his interest in bringing back both Gigan and Biollante in future sequels of Legendary's MonsterVerse as he quoted as saying "I wanted to do it, but if I had the opportunity to do it again, I would have Biollante. Oh, and Gigan!. Gigan, as a cyborg, possesses a circular saw in his abdomen and razor-sharp hooked blades in place of hands, which the monster uses to both batter and stab his opponents. According to Zone Fighter, the tips of the hooks can also release an explosive charge on contact with an enemy (Gigan's hooks were replaced with double chainsaws after being initially defeated by Godzilla in Final Wars). In addition, Godzilla Island and Final Wars also give Gigan an optically-mounted laser and the Final Wars version of his eye laser was named Giganume Cluster in Godzilla: The Game. He was also equipped with jetpacks and grappling hooks. The Pipeworks trilogy gave Gigan the ability to teleport, as well. Final Wars also introduced Gigan's ability to shoot boomerang circular saw blades which were named Blooded Slicer in Godzilla: The Game. However, his shuriken boomerang effect turned out to be a double-edged sword, as they unintentionally ended up killing him in the climax of the film. Godzilla: Unleashed (Wii – 2007) – The Millennium version is exclusive in the Wii version. Godzilla: Unleashed (PS2 – 2007) – The Showa Gigan is exclusive to the PlayStation 2 version. Gigan (a.k.a. Zymeer) is a rapper from hip-hop group Monsta Island Czars also featured on the Take Me to Your Leader album. Guitar virtuoso Buckethead wrote a song called "Gigan", as well as another named "Mecha Gigan". They appear on his 2006 albums The Elephant Man's Alarm Clock and Crime Slunk Scene, respectively, as well as inSonic Riders: Zero Gravity there are two tracks called Gigan Rocks and Gigan Device. Each has a statue of a birdlike creature with a sharp beak, which looks similar to Gigan himself. The character Ponygon from Zatch Bell has a toy that is similar in appearance to Gigan. In Billy & Mandy's Big Boogey Adventure, a monster similar in appearance to Gigan appears living on Monster Island. Wikimedia Commons has media related to Gigan. ^ Ryfle 1998, p. 183. ^ WatchMojo.com (February 20, 2015). "Top 10 Godzilla Villains". YouTube. Retrieved September 25, 2015. ^ Kalat, David (2010). A Critical History and Filmography of Toho's Godzilla Series (2nd ed.). Jefferson, N.C.: McFarland & Co. pp. 115, 125. ISBN 978-0-7864-47-49-7. ^ Ryfle, S. (1998). Japan’s Favorite Mon-Star: The Unauthorized Biography of the Big G. Toronto: ECW Press. p. 176. ISBN 1550223488.